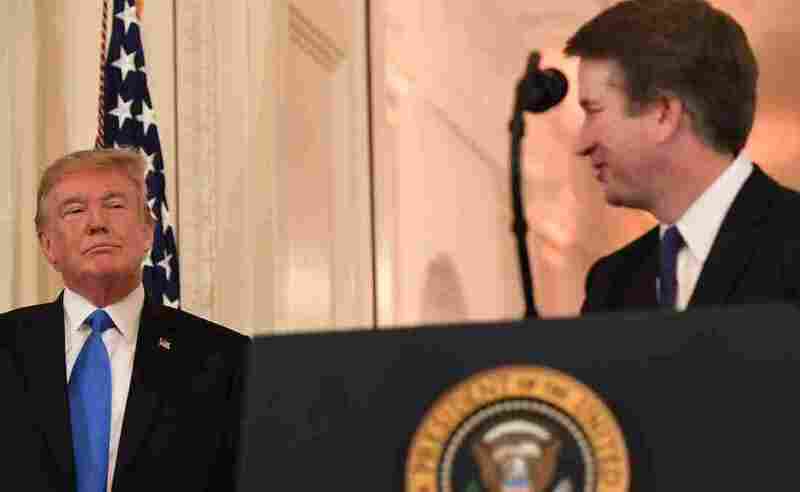 Trump Court Pick Brett Kavanaugh Could Have A Big Impact On Mueller Probe Supreme Court nominee Brett Kavanaugh opposes limiting the power of the presidency. That opinion could have profound consequences for the special counsel investigation. President Trump looks on as Judge Brett Kavanaugh speaks after being nominated to the Supreme Court last month. Among the most important — and in many legal corners, revered — Supreme Court decisions of modern times is the 1974 Nixon tapes case, U.S. v. Nixon. Kavanaugh has at times questioned the correctness of the decision, while at other times praised it. The Nixon case arose in 1974 when special prosecutor Leon Jaworski was investigating the Watergate break-in at Democratic headquarters and attempts by the president to cover it up by authorizing hush money to be paid and citing national security as a justification for ordering the FBI stop investigating. After seven of President Richard Nixon's closest aides were indicted, and Nixon was named an unindicted co-conspirator, the special prosecutor subpoenaed specific tape recordings of Oval Office meetings and phone conversations during which the break-in and cover-up were discussed. Nixon challenged the subpoena in court. He contended that it unconstitutionally violated the president's confidential conversations and his power to control information in the executive branch. The Supreme Court unanimously ruled against Nixon, declaring that even a president must comply with a subpoena if there has been a showing that the subpoenaed materials likely contain evidence of a crime. Chief Justice Warren Burger, a Nixon appointee, announced the opinion for a unanimous court, ordering the president to turn over the tape recordings. He rejected the notion that because the special prosecutor was a subordinate officer in the executive branch, the courts should stay out of deciding the issue. The special prosecutor is no ordinary subordinate, Burger said, because – much like current prosecutor Mueller — the Watergate prosecutor, by regulation, was given unique authority and tenure concerning his investigation. Finally, the court concluded that a president's general assertion of confidentiality must yield to the constitutional need for production of relevant evidence in a criminal proceeding. The case is considered a historic marker of judicial independence and stands for the proposition that no person, not even the president, is above the law. Kavanaugh seemed to agree with that characterization in a 2016 Catholic University Law Review piece where he listed the Nixon tapes decision, along with others, as "some of the greatest moments in American judicial history" where judges have "have stood up to the other branches and ... enforced the law." But the transcript of a 1999 bar association roundtable discussion shows Kavanaugh repeatedly suggesting that the Nixon case may have been "wrongly decided — heresy though it is to say so." He argued that the Supreme Court, by enforcing the subpoena, "took away the power of the president to control information in the executive branch." And he contended that the president's power as chief law enforcement officer "was diminished dramatically" by the ruling. Finally, he asked whether the decision should be overruled because it involved nothing more than an "intra- branch dispute," not subject to review by the courts. Answering his own question, Kavanaugh said, "Maybe so." That position was directly rejected by the Supreme Court in the Nixon case. So what does all this portend for the Mueller investigation? Although Kavanaugh appeared to praise the Nixon case just two years ago, the 1999 critique is similar to positions he has consistently taken as a judge — deeply skeptical of laws or regulations that limit presidential power to hire, fire and decide matters that Kavanaugh believes are reserved for the president under the Constitution. Indeed, even though Kavanaugh worked for special prosecutor Kenneth Starr, investigating President Bill Clinton in the 1990s, and even though Starr was appointed under a post-Watergate independent counsel law upheld by the Supreme Court on a 7-1 vote, Kavanaugh has repeatedly said he thinks that decision was flat-out wrong. When asked in an appearance at the American Enterprise Institute just two years ago whether he could think of a Supreme Court case that deserved to be overturned, Kavanaugh answered, "Yes." Specifically, he named the case that upheld the independent counsel law. "It's been effectively overruled," he said, in an apparent reference to the fact that Congress did not renew the law. But, he added, "I would put the final nail in." What about subpoenaing a president — or even firing Mueller? For Mueller, Kavanaugh's views could be problematic were they to prevail. One remaining unanswered question about a criminal investigation involving a president is whether the chief executive can be subpoenaed to answer questions. Trump's lawyers have suggested a subpoena would be unconstitutional. So what does Kavanaugh think? "If you believe the Nixon case was not decided correctly, then you rule against the special counsel," said Georgetown law professor Victoria Nourse. "You rule for the president." Kavanaugh, of course, has not weighed in publicly on the issue, but Mueller was appointed special counsel in the current investigation under regulations that track the regulations in the Nixon case, regulations that are aimed at protecting Mueller's independence, despite Trump's often-expressed fervent desire to have Mueller fired. As Kavanaugh has made the rounds on Capitol Hill, meeting with senators, he has tiptoed through the minefield of questions on this topic, reportedly telling senators that, in his view, the Mueller appointment was appropriate. But that does not address questions about whether the president has the constitutional power to reject a subpoena for his testimony on any grounds other than invoking the Fifth Amendment protection against self-incrimination, which is available to everybody. The open question is whether Trump may cite his power as president for refusing to give his testimony for the grand jury. The other open question is whether the president has the power to fire Mueller, regardless of Justice Department regulations that protect him from firing except "for cause." Kavanaugh's generally expressed legal views in other contexts would suggest that there is no constitutional bar to such a firing. An opaque record or a clear one? Kavanaugh's conflicting comments on all of these issues leave a record that is, perhaps deliberately, blurred. "The indictment and trial of a sitting President, moreover, would cripple the federal government, rendering it unable to function with credibility in either the international or domestic arenas. Such an outcome would ill serve the public interest, especially in times of financial or national security crisis. Even the lesser burdens of a criminal investigation— including preparing for questioning by criminal investigators— are time-consuming and distracting. Like civil suits, criminal investigations take the President's focus away from his or her responsibilities to the people. And a President who is concerned about an ongoing criminal investigation is almost inevitably going to do a worse job as President." That, of course, is a policy recommendation, not a view of current law. University of Texas law professor Stephen Vladeck draws a direct line from Kavanaugh's 1999 comments on the Nixon tapes case to his repeated and definitive hostility to the decision upholding the now-expired independent counsel law. "The line is basically that the president really isn't, and shouldn't, be subject to internal checks from his own branch," Vladeck said, adding that if that view were to prevail, "the Constitution really only provides one mechanism for a sitting president to be held accountable, and that's the mechanism of impeachment." Philip Lacovara, who argued the Nixon tapes case on behalf of the Justice Department, was the moderator of the 1999 panel in which Kavanaugh expressed doubts about the Supreme Court's decision. "I didn't think that Brett was being merely tendentious or jocular when he made his comments," he said. Although the Supreme Court ruled against Nixon unanimously, Lacovara added, "Today, of course, the philosophical composition of the court is quite different, and Brett may find more traction for his approach."